Teach is the name for the backend system created by DataCamp engineers that is responsible for building projects from the files in your private GitHub repository so the project appears on datacamp.com. The Teach dashboard informs instructors about the health of their project regarding build status and content status. If your project's build fails, Teach will let you know with a "FAIL" message in a bright red box. You can click on "Builds" to inspect the build log to see why it failed. 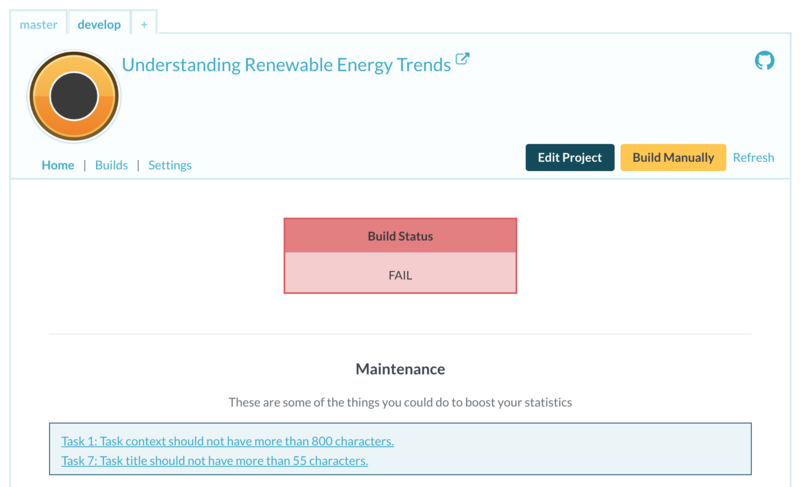 If you aren't sure why a build has failed, please contact your DataCamp representative. 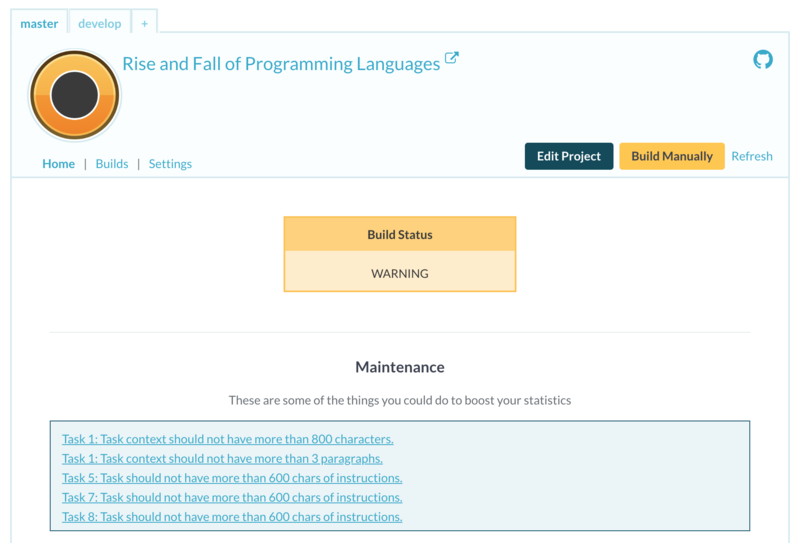 Note: do not spend too much time debugging yourself as this is most efficiently done by someone at DataCamp familiar with the ins and outs out the build system. If your project's build succeeds, Teach will let you know with a "WARNING" message in a yellow box or a "PASS" message in a green box. More on those below. If your project's build succeeds but not all content guidelines pass, a yellow "WARNING" message displays as the build status. These content guidelines include character limits, code limits, and more. It is important to adhere to these guidelines in the vast majority of cases as they represent the style of content with which DataCamp students succeed in learning most often. If your project's build succeeds and all content guidelines are passed, a green "PASS" message displays as the build status.